Video game consoles used to be just for playing games. And while my kids do play games on our Xbox 360, Nintendo Wii and PlayStation 3 (yes, I have all three — it's one of the necessities for being a tech journalist), an equal amount of time is now spent watching TV shows and movies via Netflix and Amazon Instant Video. Earlier this month, Sony announced the addition of Hulu Plus and Crackle for its Playstation Network and Microsoft is adding Nickelodeon, NHL and ESPN, including 24/7 live stream. In fact, game consoles are the most common way to watch Internet content on TVs, according to Leichtman Research Group. So it's more important than ever for parents to get a handle on what type of content kids can access through the game consoles. All three major video game systems offer some level of parental controls, protected by a password or code. 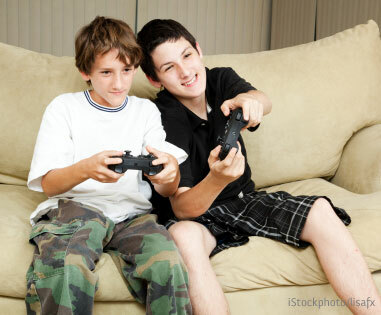 Parental controls help you restrict access to games based on their content rating and manage other potential problem areas, such as web browsing, chat and purchases (Nintendo Wii, Sony PlayStation 3 and Microsoft Xbox 360 have online stores for transactions, such as buying games and renting movies). You can create individual accounts for each of your children if you want to give different levels of access or one account that covers them all. The ESRB (Entertainment Software Rating Board) offers clear, detailed instructions for setting up parental controls on each of the three game systems. Or check out the information provided by your game console's manufacturer: Nintendo Wii, Sony PlayStation 3 and Microsoft Xbox 360. All three consoles can be set up to connect to the Internet — whether to surf the web, play multiplayer online games or chat and receive messages. And all three let you simply turn the Internet access on and off. But each has a very different set of online features. So how do you make sure your kids don't browse to off-limit sites or use other online features inappropriately? Xbox 360 uses a free service called Xbox Live for downloading games and renting movies. Upgrading to an Xbox Live Gold account (starting at $5 per month) lets you play games online with friends, video chat, watch live TV, stream movies from Netflix and HBO GO and more. For now, Xbox Live doesn't have a browser, but that's coming in the fall, so you'll want to keep an eye out for that. When it comes to chat, the default parental control is "friends only," so kids can only communicate with an approved list of other kids. And social network sharing, uploading photos through Kinect sharing and video communication are blocked automatically for kids, though video communication is enabled for "friends only" with teen accounts. The PS3 has a browser that uses its free PlayStation Network service. Parents can activate a subscription to Trend Micro Web Security for PS3 ($19.99), which will block harmful, fraudulent and other malicious websites, and Trend Micro Kids Safety for PS3 ($19.99), which prevents children from browsing to websites that are unsuitable for them. (Purchase both for $34.99.) Sony also allows parents to block all chatting activity or block individuals. Kids can only receive invitations to chat from people on their Friends list. Nintendo Wii just lets parents turn Internet browsing on or off. There are no other choices. And when it comes to chat and game play, Wii only allows communication if two players have exchanged and stored each other's Wii number with their Mii name in their respective Address Books. Each of the game consoles are set up to allow kids to download purchased or promotional content. Think movie and game trailers; add-on game content like levels, weapons or costumes; videos; and even more games. With Xbox and Wii, you buy "points" using a credit card and then use the points to redeem games or merchandise. The PS3 has a virtual "wallet" that you can add value to from your credit card. For Xbox Live Marketplace, you can prevent access to content by ESRB rating for child and teen accounts and block purchases for child accounts. The Wii's parental controls allow you to set a PIN that must be entered before making a purchase in the Wii Shop Channel. The parental controls on the PS3 let you prevent your kids from purchasing game content through Sony's PlayStation Store that is rated higher than his or her age, using the ESRB rating system. The controls also allow you to set a monthly spending limit.